Powers/Abilities: As human he was a scummy serial killer using an icepick and a pair of tongs as his weapons of choice (the latter was usually used to grab people at their necks). As ghost he had the power to possess Mr. Schenker (presumably because he was near Bob's corpse for so long) and while possessing him still used an icepick and a pair of tongs to kill people. 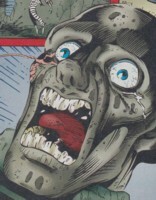 Though he was trapped in another dimension he could for a short time cross over to various places in the USA, utilizing an unexplained connection to the Nexus of All Realities (maybe he was executed nearby) and physically interact with people, injuring or dragging them to the same realm he was imprisoned in. Unfortunately for him he needed his full concentration to keep them in his prison and they could escape back to Earth him if his concentration was somehow broken. His spirit was immune to injury on Earth, but could be injured or even destroyed by mystical items or energies within the dimension he was imprisoned in. 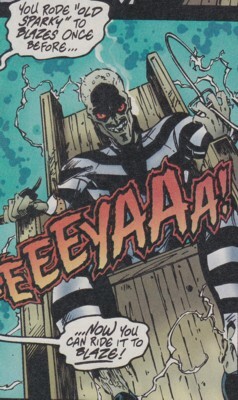 At one point he rode a flying version of the electric chair known as Old Sparky, which was empowered by Baal, into battle. (Blaze II#2 (fb) - BTS) - Bob was scared since he was born. 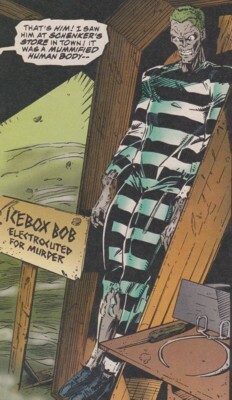 (Blaze II#1 (fb) - BTS) - Ice Box Bob became a serial killer, killing runaways for years. He was eventually caught, sentenced to death and died on the electric chair after being sentenced to death for murder. After Bob's death Mr. Schenker's father legally bought the corpse of Ice Box Bob. Schenker used to have the corpse out on display on holidays, but he had to stop doing so when people began to complain. (Blaze II#2 (fb) - BTS) - Bob's spirit got imprisoned in another dimension (presumably the Dimension of Exiles), which he could only leave if somebody else took his place there so Bob could return to Earth and become human again. Though he could drag people there it took all his concentration to keep them there. (Blaze II#3 (fb) ) - Eleven years before the events of Blaze II#1 Bob dragged Mary and Caufield Blevins to his extradimensional prison and was going to kill them, but Mary defended herself against Bob with a No. 7 Nail File, an item made of steel made powerful by the number of it, and stabbed Bob in the chest, breaking his concentration. Mary and Caufield escaped through a crack in Bob's home back to Earth where they reappeared at the Tuck It Inn motel in Conyers, Georgia. Bob tried to follow and hit them on their way out. (Blaze II#3 (fb) - BTS) - Bob slew Caufield. Mary survived and was sent to an insane asylum where she, despite being pregnant (with Holden, whose spirit went on to hunt down Ice Box Bob), committed suicide. (Blaze II#1 (fb) - BTS) - At some point Mr. Schenker, who owned Bob's corpse, got possessed by Bob's spirit and controlled by Bob continued the serial killers' killing spree (presumably this worked because Schenker was near the corpse for so long). He kept the dead rotting corpses at Schenker's cellar. (Blaze II#1) - Mr. Schenker kept Bob's corpse inside a walk-in fridge at his shop somewhere in Pennsylvania. He showed the corpse to Kody and Clara Menninger of the Quentin Carnival. (Blaze II#1) - Possessed by Ice Box Bob Schenker attacked Alexis, a woman attending the Quentin Carnival's cyclist show. Alexis' friend Cheryl saw Bob's shadow and freaked out. Bob and Alexis were gone when the police arrived and Cheryl, who was totally loosing it, was taken away in an ambulance. Clara saw Bob in a vision and told Kody and Blaze about it. Kody realized that it was the same man, whose corpse they had seen at Schenker's shop. Armed with his Hellfire shotgun Blaze drove with his motorcycle to Schenker's shop to confront Schenker, the suspected murderer. The floor at Schenker's shop collapsed beneath Blaze's motorcycle, sending Blaze down into Schenker's basement of horror, a maze with rotting meat, barbed wire and almost dead victims nailed to the wall. Blaze found Schenker, still possessed by Bob, attempting to kill Alexis with an axe, but Blaze shot him with the Hellfire shotgun to prevent the murder. Alexis was save, but Schenker got up again and rushed at Blaze with the axe. His skin was burnt away by Hellfire revealing Ice Box Bob's form beneath it. A few more shots with the Hellfire shotgun forced Bob to flee through the walk-in fridge back to his little extradimensional home. Holden Blevins, who had asked Blaze for help against Bob, appeared and showed Blaze that Bob had left behind a message for Blaze revealing that Bob knew where Blaze's abducted children were. (Blaze II#2 - BTS) - Using Clara Menninger's proximity to the Nexus of All Realities Bob sent a message through the Kristall Starrer's eyes to Clara Menninger. The eyes showed her Man-Thing and the Nexus of All Realitites where Bob planned to lure Blaze into a trap. (Blaze II#2) - Bob had chosen Blaze to replace him and everything was set in motion and ate one of the cockroaches crawling over him. In case Blaze did not show up at the Nexus of All Realities Bob still Blaze's children to lure him into a trap. (Blaze II#2 - BTS) - Holden Blevins told Blaze that the Nexus was the door to enter Bob's home dimension. Blaze didn't care much for Holden using Blaze against Bob. (Blaze II#2) - While Blaze watched Man-Thing slay the Shadrach Brothers Ice Box Bob arrived behind him through a portal. He grabbed Blaze's neck with a pair of tongs and threatened to stab Blaze with an ice pick. He warned him to shoot him again because then Blaze would never see his children again. Blaze shot him nonetheless because he would save his children anyway. Bob wasn't affected and promised Blaze the Hellfire would work where they were going. Bob tried to drag Blaze to his prison dimension, but Man-Thing, feeling Bob's fear, grabbed Bob's face and it burnt at the touch of the Man-Thing. Bob let go of Blaze and fell back through the portal to his dimension. (Blaze II#3) - Bob stabbed a Johnny Blaze poster in his little home in another dimension, angry that Blaze had sent the Man-Thing after him. Bob then talked a bit to Blaze's scared children because they were all stuck in this dimension together. Eventually Baal arrived and choked Bob for stealing Blaze's children from him. Bob promised he was only borrowing them to force Blaze to get Bob out of this dimension. Using his powers Baal enabled (and forced) Bob to sent a message through the Kristall Starrer's eyes to bring Blaze to them. Bob followed Baal's orders and arranged a meeting with Blaze at the highway through the Kristall Starrer's eyes. When Blaze and Holden arrived Baal shoved Bob into Old Sparky to ride the chair into battle with Blaze, who destroyed Old Sparky with a few Hellfire shotgun shots. The electric chair exploded and tossed Bob into the air. Bob ran away and used Blaze's children as shield, stopping Blaze from shooting Bob. Holden was not going to stop though and jumped from Blaze's shoulders at Bob driving his mother's No. 7 Nail File into Bob's head, dispersing his energy once and for all. Upon his apparent death Blaze was immediately drawn back to Earth and was forced to watch how his children were abducted again by Baal. (Blaze II#5 (fb) ) - Jesse Pinto watched Jesse Blevins drive the No. 7 Nail File into Bob's skull. (Blaze II#4 - BTS) - Johnny Blaze, Warpath, Wyatt Wingfoot and Clara Menninger encountered Ice Box Bob with the No. 7 Nail File stuck in his head while riding Old Sparky in a vision. (Blaze II#5 (fb) ) - Jesse Pinto removed the No. 7 Nail File from Bob's head. Bob still seemed dead after Jesse had it removed. Comments: Created by Larry Hama (writer), Henry Martinez (pencils) & Bud LaRosa (inks). Ice Box Bob gives me kind of a Freddy Krueger combined with Bob from Twin Peaks vibe. In Blaze II#5 it wasn't actually Bob, but part of a vision. 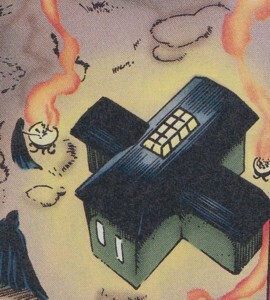 Bob's little house in another dimension was actually a mystic prison he was bound to (presumably in the Dimension of Exiles known from Hama's Tetrarchs of Entropy storyline). It was infested with cockroaches and rats. The ground was covered in mud, dirt and debris from the damaged ceiling. The wallpaper was coming down in many places and glass shards from the damaged windows were lying on the floor. Blaze's children were trapped inside the locked cellar behind bars. Though the walls were damaged there was enough room to put a poster on the wall, which Bob did...only to stab it because he was angry at Johnny Blaze...who was shown on the poster. (Blaze II#3 (fb) ) - Bob used it way back when he took the Blevins family there. (Blaze II#2-3) - Bob waited for Blaze and died fighting Blaze and Holden Blevins inside his house after luring them to his dimension with Blaze's children. (Blaze II#5-6) - Baal took up residence in Bob's home after the latter's destruction and kept the Blaze children imprisoned. They eventually escaped with the aid of Jesse Pinto and a Wendigo allowing Baal, who was bound to this place like Bob was, to escape as well by following them. Old Sparky was the nickname used for the electric chair used to carry out the death sentence on Ice Box Bob. (Blaze II#1 (fb) - BTS) - Old Sparky was used to carry out the death sentence on Ice Box Bob. (Blaze II#3) - In their prison dimension Baal pushed Bob into a spiritual version of Old Sparky, which Bob rode into battle with Johnny Blaze (yep, this chair could fly). This version of Old Sparky was destroyed by a Hellfire shotgun shell. (Blaze II#8 - BTS) - The original Old Sparky somehow got in Arcade's possession. (Blaze II#8) - Arcade, posing as the Mad Monk, showed Old Sparky to Johnny Blaze while Blaze took a tour of the Mad Monk's Murderama. Old Sparky caught Blaze's interest and he kept the Mad Monk around as an attraction at the Quentin Carnival. (Blaze II#1 (fb) - BTS) - Years ago Schenker's dad legally bought Ice Box Bob's corpse. At some point Schenker got crippled and got bound to a wheelchair. He could still run Schenker's a store for groceries, hardware taxidermy and bait, fax, postal boxes and copying somewhere in Pennsylvania. Schenker used to put the corpse on display during holidays, but stopped when people complained. He eventually got possessed by Ice Box Bob's spirit, which enabled him to walk again. Under Bob's control Schenker built a torture cellar out of wood with barbed wire on the walls. Possessed by Bob he continued his killing spree and kept the dead's rotting corpses nailed to the walls in his cellar. At some point Schenker received a package from Austria for Quentin Carnival's Clara Menninger. (Blaze II#1) - When Kody and Menninger came shopping to Schenker's store he handed over the package for Clara and showed them Ice Box Bob's corpse in his walk-in fridge. That night during the Quentin Carnival's show Schenker, possessed by Bob, abducted a young woman, Alexis. Blaze, sent on his trail by Clara and Kody telling him about Bob's corpse at Schenker's store, soon arrived at the store and accidentally crashed through the floor into the cellar. Blaze stopped the possessed Schenker from killing Alexis with an axe by shooting him with the Hellfire shotgun. The Hellfire burnt away Schenker's skin, revealing Ice Box Bob. A few more shots destroyed Schenker's body completely. Bob escaped through the walk-in fridge back to his home in Hell.